What better way to learn about schooners and sailing than to set sail aboard The Liberté in 2019? While you may know that The Liberté is a schooner, do you know which qualities distinguish a schooner from other vessels sailing on the water? What better way to learn about schooners and sailing than to set sail aboard The Liberté in 2019? Before you set sail on this exciting adventure in the new year, consider these fun facts about the rich history and recognizable characteristics of a schooner! A schooner is a sailboat built with a minimum of two masts. With this, the foremast is typically slightly shorter than the first or main mast. While a schooner may sometimes have more than two masts, most schooners contain only two. The size of the schooner enables it to sail upwind with ease, making for an enjoyable and efficient sail. With striking similarities to many 17th-century Dutch ship designs, origins of the schooner are believed to be around New England during the early colonial period of the United States. Built for speed and efficiency in coastal sailing, the design of the schooner then led to the development of the famous Clipper ship design. With its origins in the Chesapeake Bay, the Clipper ship design grew in popularity as the descendant of the schooner. Throughout its early history, the schooner was even known to be the preferred vessel of pirates! Because of their speed and efficiency, schooners were recognized as pirate ships sailing around the Caribbean, often holding more than 60 men at a time. In true pirate ship fashion, many schooners also contained nearly ten guns, with swivel guns included as well. 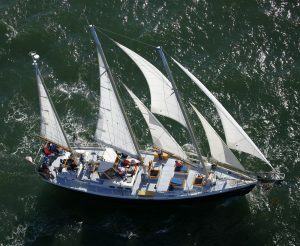 In addition to being an exciting piece of history, a schooner also offers a fun, first-time sailing experience! Not only is sailing a great way to get outside and enjoy the day, but it is also a special experience that can be shared with your friends and family aboard The Liberté. Plan your adventure in either Cape Cod or Annapolis for 2019, and experience the magic of a schooner this year! Enjoy a Sail with Your Family Aboard The Liberté! This entry was posted on Friday, January 18th, 2019 at 10:59 am. Both comments and pings are currently closed.